Follow @BoMuseMusic on Twitter, and Facebook, and now at All About Jazz. 1. I will be on the East Coast for the second half of April, giving a talk at the Institute of Jazz Studies (IJS), doing some performing, as well as visiting family and friends. On Wednesday April 17, 7:00PM, I will give a talk on Tadd Dameron at the IJS, which will include some of my recent research. The IJS is located on the 4th floor of the Dana Library, at the Newark campus of Rutgers, The State University of New Jersey, located at 185 University Avenue, in Newark. After that it is off to the Boston Area to revisit Savinos Grill with my old friend guitarist Mark Michaels. On Good Friday I will join the ensemble for Bob Franke’s Good Friday Meditations, which we have been performing since 1980. How can I not be there? My visit ends with a return to Jazz At The Tap, the Sunday night series I started in Haverhill, MA across the street from its current location. Details are in the Events on my Web-site, and in the Gigs section of this newsletter. 2. 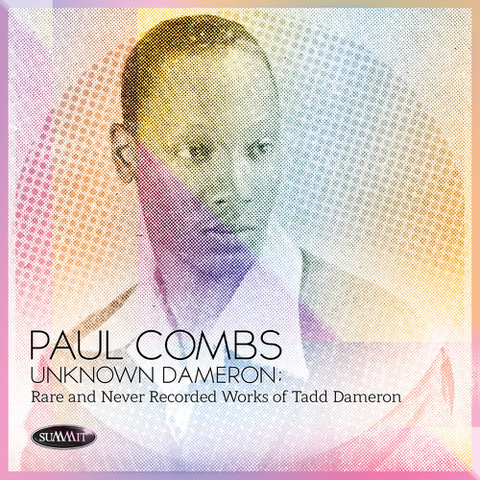 We are still on track for a June release of Unknown Dameron, my new CD on Summit Records. The tracks are all mixed and mastered, and as you can see we have the cover art. All that’s left is the booklet, and then we go into manufacturing. As I think I have said before, I feel it is an honor to have this CD come out on Summit. 3. My friend Vanessa Rubin has released her long awaited CD of songs by Tadd Dameron. For this project Vanessa commissioned little big-band arrangements from writers who knew Tadd personally, Benny Golson, Frank Foster, Jimmy Heath, and Cleveland’s Willie “Face” Smith. There is also a lovely chart of “Never Been In Love” from Bobby Watson. Vanessa has also written lyrics for some of Tadd’s instrumental compositions including “The Dream is You,” from a big band project Tadd arranged for Milt Jackson. With Vanessa’s lyric it is titled “Reveries Do Come True.” The project got a nice write up in Down Beat magazine, and it is available from CD Baby and iTunes, the links are at Vanessa’s Website. I had the honor of writing the liner notes. 4. While I have known for some time that video has become a marketing necessity in the 21st Century, I have had difficulty getting a handle on it. After a couple of tries over the last decade, I am finally ready to start my own YouTube channel. If it isn’t up with an introductory video by the time you read this, it should be soon after. I hope to have at least this first little place holder up before I head East. Meanwhile, I have a professional videographer/editor/director friend of mine, John Brooks, working on a promotional video for the CD, which should be ready very soon. Maybe we can get that one up before I fly out, as well. If you will forgive the “Extra,” (I try to keep them to a minimum) I will announce the channel when it is viewable. Thank you to those who came out to hear Dave Castel Del Oro and me at la Mesa Wine Works. Dave and I will be playing at the San Pasqual Winery Tasting Room and Gallery, 8364 La Mesa Blvd, La Mesa CA, on Saturday April 6 at 7:00 PM. It will be our first time there together. I continue to play with Dene Davidson on Tuesdays, 6:00 PM, at Witch Creek Winery, and Wednesdays around the corner from there in the courtyard of Carlsbad Village Faire, with the addition of guitarist Joey Carano, at 2:30 PM. Dene and Joey will carry on without me while I am gone, but I will be back on May 1. While I am away. On the East Coast, there is my talk at the Institute of Jazz Studies, 7:00 PM, April 17 in Newark; a duo with Mark Michaels at Savinos Grill in Belmont, MA, 8:00 PM, April 18; Bob Franke’s Good Friday Cantata, 8:00 PM, April 19, at St. Andrew’s Episcopal Church in Marblehead, MA; and a Paul Combs Quintet at the Tap in Haverhill, MA, April 28, 6:30 PM. Addresses for all of these are listed in the Events section here at paulcombs.com. If you are in Boston check the listings at Jazz Boston, visit the Facebook page for Jazz at the Tap, and the Seacoast Jazz Society Web site. In San Diego visit the Calendar section at Jazz88.3. There are no house concerts to announce this month, but be sure to watch this sections for more in the future. 1 Ah, it’s that time of the year again: the Grammys are awarded. I joined the National Academy of Recording Arts and Sciences so I could show support for our corner of the commercial music world. I have to admit that this year I did not vote. NARAS changed their system for voting, and I found that just trying to deal with the online rig-a-ma-roll was complicated and frustrating, and I had too many other things to do. In addition, I take my vote seriously, so the process takes a few evenings of listening carefully. With few exceptions, everything that makes it to the final round is of very high quality, and the choices are rarely easy. I will have to deal with the new system next year, and others told me of similar frustration with the new system, so we will hope for some improvements. That being said, here is the list of those who were nominated with the winners at the top of each category. Jazz is very much alive, and there is a lot of great music being made and recorded. Try to support as much of it as you can. 2 I have mentioned the house concerts at Wolfe Gardens in the last two issues and that has led me to try to come up with a way to get the word out, without publicly posting the address. 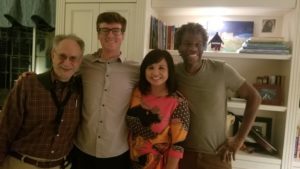 Recently I attended another house concert, this one featuring Joe Garrison’s Night People. I received another invitation from Joe just a few days ago, but I have not had time to discuss with him how I might properly share this with my readers. However, I can share this link to his Web-site where you can meet Joe and his music. I will be happy to share, discretely of course, any information about house concerts that you may be able to pass on to me. If you would like to go, let me know and I will pass your contact on to Deborah. 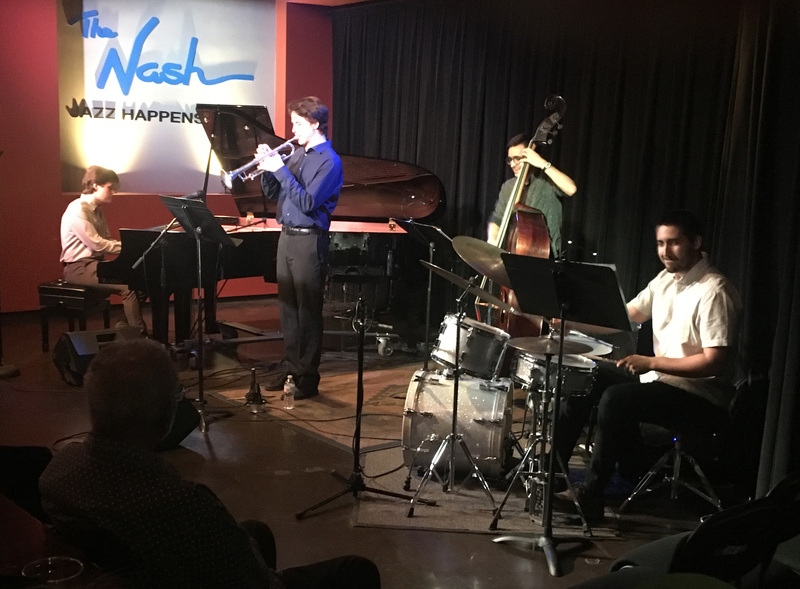 The last concert with bassist Sean Hickey, leading a band featuring guitarist, Louis Valenzuela, vibraphonist Matt Di Biase, and drummer Julien Cantelm, was a delight. 4 I had heard about Jazz at the Merc in Temecula, CA not too long after I settled here, but it took a while for me to get up there for a concert. Its director, and a wonderful jazz singer in her own right, Sherry Williams, presents weekly shows on Thursdays, and at the end of January my friend Kamau Kenyatta was playing there with a quartet that included other friends, Justin Grinnell, Richard Sellers, and Curtis Taylor. I had to go. The Mercantile is a large building, or couple of buildings actually, that houses two theaters, one large and one small. Jazz at the Merc lives in the small theater, a charming and intimate performance space. Sherry also presents concerts on other days on occasion, and at the end of February a room full of us had the distinct pleasure of hearing the great drummer Ralph Peterson lead a sextet of former members of Art Blakey’s Jazz Messengers: Essiet Essiet (not in the picture above), Brian Lynch, Bill Pierce, Bobby Watson, and a younger pianist, whom Blakey surely would have hired, had he lived long enough, Zaccai Curtis. What a treat. In addition to the Thursday evening shows, they will have their 8th annual Jazz Festival on Sunday, March 10. 5 With all the preparations for the CD release, I haven’t had much time to go hunt for gigs, so I am grateful to my friend Dene Davidson for keeping me busy. I will be playing with him every Tuesday evening 6:00-9:00 at the Witch Creek Winery, and every Wednesday afternoon 2:30-4:30 at the Carlsbad Village Faire. I’ll be at the La Mesa Wine Works with pianist David Castel Del Oro on Sunday, March 24, 1:30-4:30. addresses are in the Events page here at my Web-site, just click on the tab above. If you are in Boston check the listings at Jazz Boston, visit the Facebook page for Jazz at the Tap, the Seacoast Jazz Society Web site, and this just in from a dear friend in Brookline, the Post Underground. In San Diego visit the Calendar section at Jazz88.3, and again Jazz At the Merc. Also just a reminder that the weekly jazz performances at the Handlery Hotel have moved to Sundays, 4:30 to 6:30. Fortunately, you can still hear some jazz at the Handlery, 950 Hotel Circle, San Diego CA, on Fridays, 5:00- 8:00, since my friend Adam Wolff will be at the piano there regularly, often with a guest or two. 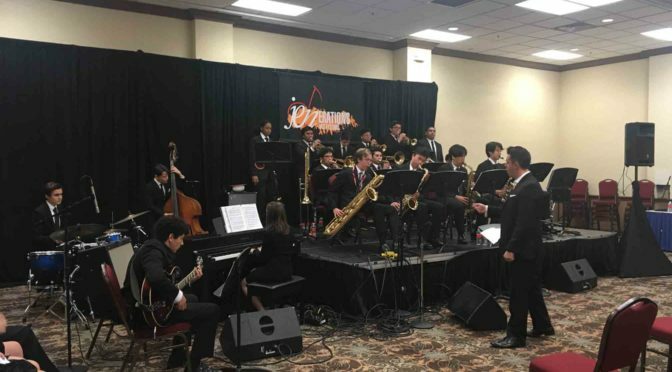 1.The Ellington Band, the premier jazz band from San Diego’s School of Creative and Performing Arts, gave a superb performance at the Jazz Education Network Conference, in Reno, NV. In spite of bad colds, and having a 9:00 AM time slot, the students gave a very polished performance of the set they had prepared. So much so that the clinic judges had only very minor points to make to them after expressing their delight in what they heard. It should be noted that the band is made up of very few seniors. Dr. John Reynolds is also entering this band in the Essentially Ellington Festival competition. The SDSPCA band was one of 15 selected a couple of years ago, and we wish them all success in making a return visit to New York. I will keep you posted. More on John Reynolds here. 2.As you may know, the Jazz Education Network, JEN, was started 10 years ago in the wake of the financial collapse of the International Association for Jazz Education. It holds an annual Conference for its members, that includes sessions on various topic of interest to the Jazz Education community, concerts by both professionals and students, and an exhibition of relevant products, as well as institutions to which student musicians would like to apply. I should note that it is my understanding that music education conferences are the only ones to which educators bring their students. This provides not only an opportunity for the the educators to hear the results of each other’s work, but for the students to interact with many teachers, and other students. This year’s conference was a good one for me in both the sessions I attended, and the networking I was able to get done. The only down side was he choice of venue, an enormous casino/resort/hotel in Reno, NV. Between the second hand smoke, and the close proximity to numbers of people mindlessly, in my opinion, playing slot machines, I and others did not think this a healthy environment for the youngsters in our care. Also the location was difficult to get to for too many of the exhibitors. That being said, it was in it’s size and facilities a good venue, and I would think this is why it was chosen. Having sat on committees tasked with finding a venue for a conference, I do understand the challenges facing those who have to make this choice. 4.After the Conference I went to Phoenix to meet with Darby Christiansen of Summit Records. Summit will be releasing the Unknown Dameron CD in June, and we met to work out some of the logistics. By the time you read this the tracks will be in their final form, mixed and mastered, and we will be addressing the notes and artwork. I am proud and delighted to be releasing this project on the Summit label. There was a time, not too long ago, when I had given up hope of being able to present some of the little-known, and unrecorded tunes and songs of this great American musician. Thanks to the folks at KSDS who had me celebrate Tadd’s 100th birthday with a broadcast concert, I was able to make this happen. 5.Gigs: The Wednesday afternoon gig, 2:30-4:30, that Dene Davidson established at the Carlsbad Village Faire continues. Carlsbad Village Faire is located at 300 Carlsbad Village Dr., between Pacific Coast Highway and the railroad tracks. In addition Dene now has a gig at Tuesday evenings, 5:00 – 8:00, at Witch Creek Winery. I will join him on February 5 and 19. Adam Wolff and I will return to the La Mesa Wine Works on Sunday February 24, from 1:30 to 4:30. The Wine Works is a lovely place to hang out on a Sunday afternoon, and we hope to see you there. See the details here. If you are in Boston check the listings at Jazz Boston, visit the Facebook page for Jazz at the Tap, and the Seacoast Jazz Society Web site. In San Diego visit the Calendar section at Jazz88.3. 1 I hope your will forgive me for repeating an item from last month, but I do want to make sure to get the word out about My friend, pianist Lenore Raphael who will be playing at Wolfe Gardens, the house concert hosted by Deborah Wolfe, in a duo with bassist Rob Thorsen on Friday January 4, at 7:00. Since the concert takes place a Deborah’s home, I won’t provide the address here, but you can contact me and I will pass your email on to Deborah, who can add you to the invitation list. Lenore is Steinway Artist who is well established on the East Coast. She Typically makes a West Coast tour in January. Last year schedules worked out so that she could play the Jazz Happy Hour at the Handlery Hotel, and she delighted the full house audience. This year her tour includes several venues in California, including *The Merc, in Temecula, and the Vibrato, in LA. Lenore will also be performing at the Tuscon Jazz Festival. This will be our chance to hear her here in San Diego. As last year, I will sit in for a number of two, as well. 2. Last spring I started playing at the La Mesa Wine Works on a semi-regular basis. 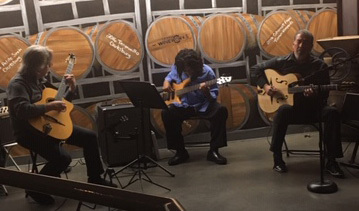 La Mesa Wine Works is a comfortable and cheerful space with good acoustics, and the management has made it a home for musicians in a variety of idioms, including jazz. Last Weekend the jazz, which is most often presented on Sunday afternoons, was featured on Friday and Saturday evenings, with Larry Friedman’s Schrodingers’ Jazz Cats on Friday, And the Gypsy Swing Cats, featuring Steve Nichols and Guy Gonzalez on Guitars, with Cecil McBee Jr. on Bass on Saturday. Both evenings were pleasurable, with some fun interpretations of Christmas songs sprinkled in, including a 5/4 rendition of Jingle Bells. I will be there on Sunday, December 30, 1:30 to 4:30 with pianist Adam Wolff, and again on Sunday, January 27, with pianist Dave Castel Del Oro. The wines are tasty, and you are welcome to bring a picnic lunch or dinner. The full calendar is here. 3. It’s almost time for the Jazz Education Network (JEN) Conference, and, unlike last year, this time I will be able to attend. JEN, as you may know, is the successor to the International Association of Jazz Educators, and is one of the major music education organizations. One of the great features of music education conferences is performances by student groups. Unlike other educator conferences, say language, history, or mathematics, music educators bring their students to the conference. In fact San Diego’s own School of Creative and Performing Arts (SDSCPA) is sending its top jazz ensemble, the “Ellington Band” to this year’s conference in Reno NV. 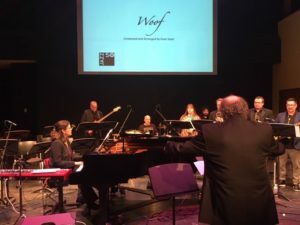 Recently, I got to hear the band, under the direction of Dr. John Reynolds, when they performed at Dizzy’s, and I am certainly looking forward to hearing them again at the conference. 4. Since the deadlines for these scholarships is still a couple of weeks away I would like to repeat this information, which came to me via the Arts Education Resource Organization (AREO) and the La Jolla Playhouse. Another ATW Andrew Lloyd Webber Initiative scholarship helps middle and high schools students attend summer theater training programs. The area of study can be any aspect of theatre- acting, directing, design, etc. Click here for a list of theatre programs by state. the deadline to apply for a 2019 Training Scholarship is Friday, January 18th, 2019 at 11:59PM EST. There is no fee to apply – click here to start an application..
5. With this issue I enter the 19th year of putting out this news letter. With only a month here and there missing, mostly during my move to the West Coast and getting settled out here, it has been an almost continuous venture that has covered a period of time that included fall of the IAJE, the founding of Jazz Week, the passing of great musicians, and the arrival of new ones on the scene. While this is one of my ways of maintaining some awareness of my own humble efforts as a musician, I hope I have managed to inform my readers of various events, organizations, and personalities other than myself. I plan to continue this, and hope you find this newsletter useful and informative. A couple of years ago my mailing list was lost in the demise of the mailing service I was using. If you do enjoy these newsletters, please consider forwarding them to others. Subscriptions can be made by simply emailing me at this address, or contacting me here with the contact form at the bottom of the site. 6. Gigs: The Wednesday afternoon gig, 2:30 4:30, that Dene Davidson established at the Carlsbad Village Faire continues. Carlsbad Village Faire is located at 300 Carlsbad Village Dr., between Pacific Coast Highway and the railroad tracks. In addition Dene now has a gig at Tuesday evenings, 5:00 – 8:00, at Witch Creek Winery. I join him occasionally, but my January is filling up, so I cannot say at the moment just which Tuesdays I will be there. As mentioned above Adam Wolff and I will return to the La Mesa Wine Works on Sunday December 30, from 1:30 to 4:30. The Wine Works is a lovely place to hang out on a Sunday afternoon, and we hope to see you there. See the details here. 2. U. Arts. 50th Anniversary of Jazz Ed. 1. My friend, pianist Lenore Raphael will be playing at Wolfe Gardens, the house concert hosted by Deborah Wolfe, in a duo with bassist Rob Thorsen on Friday January 4, at 7:00. Since the concert takes place a Deborah’s home, I won’t provide the address here, but you can contact me and I will pass your email on to Deborah, who can add you to the invitation list. Lenore is Steinway Artist who is well established on the East Coast. She makes a West Coast tour in January. Last year schedules worked out so that she could play the Jazz Happy Hour at the Handlery Hotel, and she delighted the full house audience. As last year, I will sit in for a number of two, as well. current and former students. My thanks to Mike for getting me to attend and reconnect with my alma mater, which I am proud to have attended. 3. I have pretty much finished revamping this Website, www.paulcombs.com. As with any Website, it is a work in progress, but the big changes are finished. Since I no longer have my teaching studio in Cambridge, that section of the site has been repurposed to hold information on my continuing educational work. 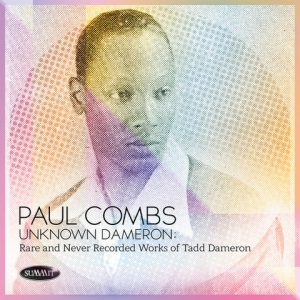 The Main section focuses on me as a performer, and the third section is now a store, where my CDs and arrangements are available, as well signed copies of Dameronia – the Life and Music of Tadd Dameron. This last section of the site is still being developed, but it is at least possible to make purchases via email. It will take a while to get the direct purchase (credit card, PayPal, Venmo) programming done. I hope you will have a chance to explore the site, and welcome your comments and suggestions. 4. AERO, the Arts Education Resource Organization of San Diego, continues to develop its organizational strength. When I joined the Governance Committee a little over two years ago, we were the only group helping to guide the then-resurgence of AERO. Now we have four committees, which means we can get more done, and involve more people. In addition to connecting professional providers of arts education, from large organizations like The San Diego Opera and Arts For Learning, to individual artist/educators, AERO organizes professional develop events for arts/educators, and works to advocate for arts education in our schools, both the work of visiting artists, and the programs resident in the schools. Membership in AERO is open to all qualified teaching artists and related services that address the needs of elementary and secondary schools. More information can be found here. Another ATW Andrew Lloyd Webber Initiative scholarship helps middle and high schools students attend summer theater training programs. The area of study can be any aspect of theatre- acting, directing, design, etc. Click here for a list of theatre programs by state. the deadline to apply for a 2019 Training Scholarship is Friday, January 18th, 2019 at 11:59PM EST. There is no fee to apply – click here to start an application. 5. As a follow up to the item that included news of the Louis Armstrong House in last months issue here is an article about Louis’s house, and his collected papers and personal recordings by Giovanni Russonello, from the New York Times. If you are visiting New York I highly recommend a visit to his house, but if you cannot you can still visit the Louis Armstrong House Museum Website and see the digitized collection. The Wednesday afternoon gig that Dene Davidson established at the Carlsbad Village Faire continues. We, the core band of Dene on bass, guitarist Joey Carano, and I, are grateful for the support of the businesses at Village Faire, as well as that of the management. Adam Wolff and I will return to the La Mesa Wine Works on Sunday December 30, from 1:30 to 4:30. The Wine Works is a lovely place to hang out on a Sunday afternoon, and we hope to see you there. See the details here on the Events page. BoMuse News is a monthly newsletter from BoMuse Music. It presents items of interest related to jazz, and advocacy for music education, as well as news of releases from BoMuse Music and the performing activities of Paul Combs. The acoustics at Deborah Wolfe’s home are also perfect for small groups, even with drums – and the right drummer, of course. There is a small grand piano, and room for 25 to 35 people to sit comfortably. The intimacy of these spaces provides an almost conversational environment for the performers and listeners. We even had audience members ask a couple of very good questions between numbers. I hope to find more opportunities for this kind of performance, especially with the CD coming out next year. If you, dear reader, should have any leads on house concerts, please let me know. 2. First bad news from San Diego – I always like to give the bad news first. The restaurant that has hosted the Northern Spirits Jazz Club in San Marcos for the last few years, has closed, leaving Norm Murphy, who booked the musicians without a venue. Norm has expressed to me that he will be looking for another, and we wish him all success in this. Many nights of excellent music took place there, and I feel honored to have played there a couple of times. Another music series looking for a new venue is the concerts that were being given in the lovely little auditorium at the Mission Trails Regional Park Visitor Center. These concerts, organized by a volunteer group, are presented twice a month, and will stop at the end of the year. They featured a great variety of genres. I attended a delightful concert of percussion music, mostly from regions of Africa, organized by N. Scott Robinson. Of course there have been performances by jazz musicians as well. There are four more concerts scheduled this year, and the small auditorium is very pleasant. Watch for new of a resumption of this series of concerts at a new venue. The good venue news is on the East Coast. The Press Room, in Portsmouth, NH, has long been a home for jazz in the New Hampshire/Southern Maine area. I played there from the time it opened in the late 80s, until just before moving out to San Diego. A couple of months ago it had to close for renovations. Many were worried that this would be the end of its long-standing jazz-friendly booking policy. To everyone’s delight it reopened on Halloween, with the Sunday Jazz and Tuesday jam session intact. I did not see mention of the Monday jazz down stairs, but you can visit their Web site to see what is happening. 4. I only have a couple of gigs this month, so I will include a little report on my visit to Key West Fl, and a worthy project involving a couple of good friends of mine. Erika Biddle, one of the friends I was visiting, is organizing large public exhibit titled “Blind Spots: Modern Slavery Exposed.” Part of this grew out of the work of Len Morris of Galen Films, another friend, and Len will be one of the speakers at events around the installation of the Blind Spots exhibit. I will report again on this as we get closer to the February date of the exhibit. 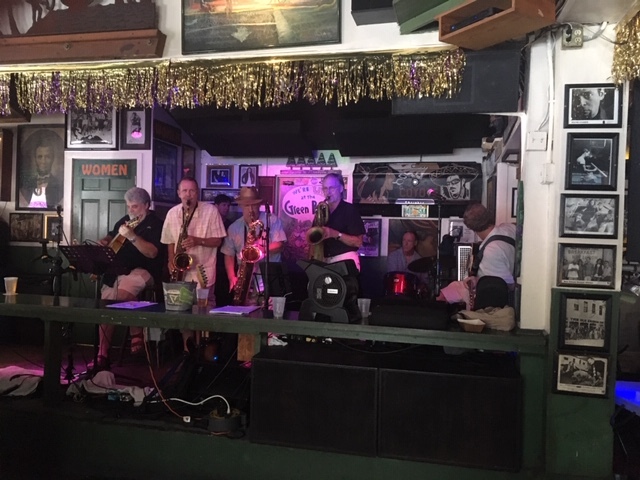 While I was in Key West I sat in with this band at the Green Parrot, and met some fine musicians with whom I found I had mutual friends. The Sunday afternoon jam session is not listed with the events, but if you are down there, I believe you can count on it; 1:00-4:00 on Sundays. Adam Wolfe and I will play at the La Mesa Wine Works on Sunday, November 1:30-4:30. La Mesa Wine Works often has jazz on Sunday afternoons, the wines are excellent and you are welcome to bring food. A great place for a Sunday hang with friends. I will be in the band with Dene Davidson and Joey Carano at Carlsbad Village Faire in the afternoons on the first two Wednesdays in November. I will be out of town for the last two, but that should not keep you from stopping by the lovely courtyard there to hear the guys, and whoever sits in for me. As always, the details are available Events. The Saturday before this concert, October 13, you can hear Melonie and me in an afternoon recital at the La Mesa Branch Library, 8074 Allison Avenue, La Mesa, CA. We start at 1:00 PM, and the recital is free and open to the public. Melonie is one of my very favorite San Diego pianists, and I am looking forward to this duo performance. 2. Good News!! The Sunday jazz series I started back in 2002 in Haverhill, MA, will continue. It will now be hosted by The Tap, which is right across the street from the series’ old haunt the Chit Chat Lounge, at 100 Washington St. This venue has the additional advantage of tables and food. The folks at The Tap also brew their own beer, which I remember as being very good, indeed. The series kicks off on Sunday, October 14, at 6:30 PM with the Pocket Big Band. For now news of the Sunday jazz series is still at the Jazz at Chit Chat Facebook page, but a new page will be established soon. Carry on my old friends! 3. The Unknown Dameron CD will be out on the Summit label in June, if all goes according to present plan. As reported, the tracks are all recorded, and mixed. We are now finishing production, gathering the elements of the package, and laying the groundwork for a full promotion campaign. 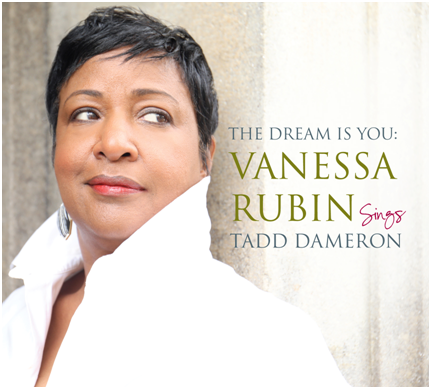 I would also like to announce that Vanessa Rubin’s Dameron CD, the title of which I believe will be Vanessa Rubin Sings Tadd Dameron, should be out in February or March, and we hope to be as coordinated as possible in our promotion efforts. Please stay tuned. In addition to the recital at the La Mesa Branch Library, and the house Concert at Wolfe Garden, I will be in the band supporting vocalist Erica Marie at the Cuvée Club in La Jolla on Friday, October 12. Last, but not least, the Wednesday afternoon jazz with Dene Davidson’s San Jose Sound, continues at Carlsbad Village Faire, from 2:30 to 4:30-5:00. I love playing there with Dene and guitarist Joey Carano, and watching the little children play around the fountain, and dance to the music. Details are at my events page. If you are in Boston check the listings at Jazz Boston. In San Diego visit the Calendar section at Jazz88.3. Follow @BoMuseMusic on Twitter, and Facebook , and now at All About Jazz. 1. Back in 2002, after I put the Pocket Big Band together, I wanted to find a place where we could play regularly, develop the band, and build an audience. A friend, Patty McCarron, suggested I get in touch with another friend, Gary Scena of the Chit Chat Lounge in Haverhill, MA. The Chit Chat booked rock bands and singer/songwriters, and I actually had some history with the place going back to the 1970s. The stage was dark on Sundays, and Gary offered me the night. We recorded our Sea Breeze Jazz CD, aptly titled “Live At Chit Chat,” there, with Gary as engineer. In an effort not to ware out our welcome, I started booking other local jazz folks on alternate Sundays, and Jazz At Chit Chat was born. From piano trios to big bands, we presented jazz pretty much every Sunday from that point until just a week or so ago. 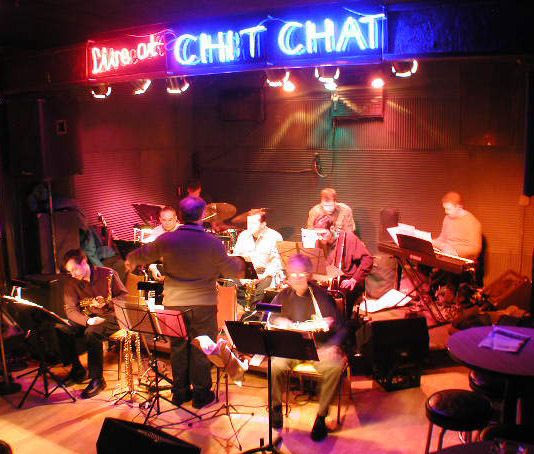 Jazz at Chit Chat managed to survive two changes of ownership over the years, but with the most recent change of owners, it has come to an end. It was a good run, some 16 years, and I am delighted to say that both the Pocket Big Band and Jazz At Chit Chat survived my departure, thanks to the efforts of John Doherty, Mike Jacobs, and many others of the stalwarts of the Sunday jazz series. Efforts are being made to find a new home for the Pocket Big Band and the Sunday jazz series in the lower Merrimac Valley. I will be watching developments closely, and for now so can you at the Jazz At Chit Chat Facebook page. By the way, “Live At Chit Chat” is out of print, but I will soon have it available from my Website, which is being rebuilt as I write this. 2. We had to postpone a house concert in June (v17, n6) and I am happy to say that we have been rescheduled for Saturday, October 20. I will have more about that in the next issue, but I do want to tell you about this wonderful series of concerts at the home of Deborah Wolfe. On Friday September 7, Pianist Jeremy Siskind will perform with a quartet. Siskind, teaches at Fullerton (CA) College, and was winner of the 2012 Nottingham International Piano Competition, and has toured extensively internationally. On Friday September 21 a trio of well-known New York based musicians, guitarist Roni Ben Hur, bassist Harvey S, and drummer Silvia Cuenca, will be Deborah’s guests. Needless to say, I feel honored to be included in this series. Since these concerts take place in a private home, I would publish the location, but if you would like to attend either or both of these concerts, you can contact me and I will put you in touch with Deborah. 3. As I have reported here before, I sit on two committees of the Arts Education Resource Organization (AERO). One of them, the Professional Development Committee, will present its first workshop of the season, Creative Collaborations With Arts Integration, on Saturday, September 8, 9 AM – Noon, at the La Jolla Playhouse, 2910 La Jolla Village Drive, San Diego. As described by the organizers, “the workshop will be of interest to teaching artists, classroom teachers, administrators, as well as parents. In this interactive workshop, we will explore what Arts Integration is, look at co-teaching models, experience an Arts Integrated lesson, and collaborate with other educators to develop an Arts Integrated lesson plan.” The workshop is free for all AERO Organization Associates, and only $15for non-members. You can see the flyer for the Creative Collaborations With Arts Integration workshop here. On the second page there is as list of AERO Organizations Associates. 4. I had a delightful and productive time in San Jose. 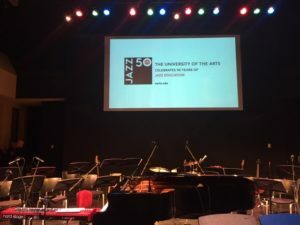 First the JazzWeek Jazz Summit, which was concerned with how we in the jazz community can roll with all the changes that are that are happening in the professional arts world in general, and the jazz world in particular. This was particularly timely for me with the upcoming release of my new CD, and the promotional campaign that I am starting to prepare. As a result, I am reworking my Website, and hope to have this done by October. The San Jose Jazz Summer Fest was a wonderful as always. Highlights for me included Yissy García’s Bandancha, Doug Beavers’ Titanes Del Trombón: Tribute to Cheo Fleiciano, and serving Sunday as the MC at one of the stages. I got to hear bassist/vocalist Jeff Denson, who played on the San Rafael session for the new CD, perform pieces from his new CD, and I even sat in on a number with one of the bands, Octobop. In short, I heard a lot of great music, caught up with old friends, and made some new ones. I have three big gigs coming up in the next few weeks. First, the Jazz Happy Hour at the Handlery Hotel, with Melonie Grinnell, piano, and Antar Martin bass. If you haven’t discovered this wonderful listening room, you really should. Every Friday, from 5:30 – 7:30 esteemed flutist Holly Hofmann and the hotel present some of the best small group jazz, including performances by visiting dignitaries. On Saturday, September 15, I’ll lead a quartet of Jim Guerin, piano, John Ross, bass, and my old friend Matt Taylor, drums, at Northern Spirits in San Marcos. We start at 7:30 and the Thai food is delicious. On Friday, September 28 I’ll give a concert at Dizzy’s here in San Diego, with Hugo Suarez, piano, Antar Martin, bass, and Matt Taylor, drums. There is no cover at the Handlery or Northern Spirits, where food and drink are available. Dizzy’s is a concert setting and the admission is $20.00 at the door. Details are in the Events page here at my Website. If you are in Boston check the listings at Jazz Boston, and check out the exciting series at the University of New Hampshire Traditional Jazz Series, with Carl Allen, Joe Lovano, Bobby Watson and more! In San Diego visit the Calendar section at Jazz88.3. 1. It’s August, and that means it’s time for the JazzWeek Summit conference, August 9 & 10. The Summit is a gathering of jazz radio, radio promotion, independent label, and artists for the purpose of focusing on the health specifically of jazz radio, and generally the jazz “eco-system.” I have been attending this almost since its inception, and it has not only benefited me professionally, but has introduced me to a community of exceptional people, many of whom have become friends. The Summit is kind of “family reunion” for many of us. The JazzWeek Summit is typically scheduled with a jazz festival. In the past we have met just before the Rochester International Jazz Festival, and the Detroit Jazz Festival. This year we are again meeting in connection with the San Jose Jazz Summer Fest. Along with our registration for the conference, we are given passes to the Festival. We are also invited to emcee one or another of the stages, or individual concerts. I like to give something back to the Festival, so I will be the MC for the Sushi Confidential Stage on Sunday, August 12. If you are at the Festival, stop by and say hello. “Thanks to your emails and calls, the U.S. Senate and House both voted to increase NEA funding by $2.2 million (1.42%) for 2019. The spending package approved earlier this week also increases the National Endowment for the Humanities budget. The House and Senate will meet in the coming weeks to settle differences in the legislative language between their bills, and there should be one more round of votes before the bill goes to the President. Union musicians and other members of the arts community sent emails, made phone calls and had conversations with their elected officials about the importance of federal arts funding. This shows that when musicians join together, we can achieve amazing results. When musicians join together to fight, we win! 3. We have completed the recording of The Unknown Dameron (working title). Richard Sellers is fine tuning the mixes, and I am working on the liner notes. As soon as the label and I have agreed on the sequence of the tracks, I’ll be able to tell you more, including a likely release date. In the mean time you might want to check out Madd For Tadd, a CD of big band arrangements by Tadd Dameron put together by Kent Englehardt and Steve Enos. The Web site for the label is a little eccentric, but you can preview the tracks and purchase the CD there. Also keep an eye on Vanessa Rubin’s Web site for her soon to be released CD of Dameron songs, with arrangements by Frank Foster, Benny Golson, Jimmy Heath, and Tadd’s close friend Willie “Face” Smith. September is shaping up to be a good month for me in terms of performing. Starting with the Labor Day Weekend. While technically still August, I will be playing the Jazz Happy Hour at the Handlery Hotel, 950 Hotel Cl., San Diego, on Friday the 31st. Joining me will be pianist Melonie Grinnell, and bassist Antar Martin. Antar will be on hand again on Friday September 28, when I play at Dizzy’s. There, Antar and I will be joined by pianist Hugo Suarez, and my old friend drummer Matt Taylor. I will continue to play on Wednesday afternoons at the Carlsbad Village Faire as part of Dene Davidson’s Santa Cruz Sound. Still to be confirmed are a September 15 date at Northern Spirits in San Marcos, and a regular, perhaps by-weekly evening in Carlsbad. For the latest on these please follow my professional page at Facebook, or consult the Events page here at www.paulcombs.com. We will be upgrading the site soon, so the exact place on the site may be different from what it is at the moment. I have some potentially sad news from back in Massachusetts. Jazz At Chit Chat, the Sunday jazz series I started some 15 years ago in Haverhill, MA, may soon come to an end. If you live in northeastern Massachusetts or southeastern New Hampshire, please go support the musicians in the coming weeks. It might convince the new owners to keep the series going. The Chit Chat lounge is located at 103 Washington St., in Haverhill, MA. You can follow the series on Facebook where the calendar for the next two months is posted. If you are in Boston check the listings at Jazz Boston. In San Diego visit the Calendar section at Jazz88.3. 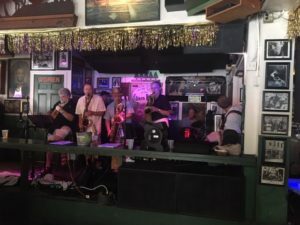 Note: the listing for the Jazz Happy Hour are on the home page of Jazz88.org, scroll about 2/3 of the way down the page.